Creating Infographics with free templates and symbols. Making infographics has never been easier. Start a free trial and make presentation-quality infographics right now! Contains some basic drawing shapes, icons, charts, maps and clip arts for creating business infographics. Contains special shapes, clip arts, maps, charts and tables for creating education infographics. Contains special shapes, clip arts, maps, charts and tables for creating food infographics. Contains some basic drawing shapes, icons, charts, maps and clip arts for creating medical infographics. Contains some basic drawing shapes, icons, charts, maps and clip arts for creating environment infographics. Contains some basic drawing shapes, icons, charts, maps and clip arts for creating transportation infographics. 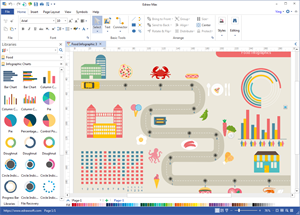 Contains special shapes, clip arts, maps, charts and drawing tools for creating architectures infographics. Contains special clip arts, icons and templates for creating music infographics. Contains special clip arts, icons and templates for creating tourism infographics. Contains special clip arts, icons and templates for creating news infographics. Contains special clip arts, icons and templates for creating technology infographics. Create infographics easily with this drag-and-drop infographic maker. You can not only use built-in infographic elements, but also draw new graphics on your own. It offers endless possibilities to visualize your data and ideas. You can set page size freely and make personalized infographics with any style you like. When finish, it helps export the infographics to a variety of file formats.